AKA someone bought a really bad calendar. 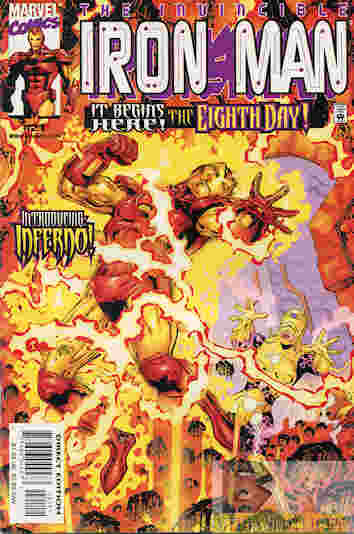 In the first story Warbird helps Iron Man deal with a fire at a Roxxon Oil refinery. It’s mostly there to continue the storyline about Tony trying to help Carol with her alcoholism but also mentions the other storyline about another dead Madame Masque, which is identical to the first down to the fingertips. We’re getting close to Furman levels of subplots but the story overall is okay. The only good comes from coloring. One guy’s shirt changes color during a flashback and a couple of the caption boxes have too dark a gradient on them so their hard to read the text in the beginning. Otherwise it’s either here to remind readers (or inform new readers) that these events are going on or because the prologue to the “Eighth Day” mini-event wasn’t long enough. What they got right: The story arc is set up well enough, with a strong threat revealed only at the end, and a swerve in the form of Little’s rivals, who claim they’re only here to help. It’s a plot hinted at during the party a few issues earlier. What they got wrong: I think they played up Sam’s hatred of the cold a bit much but that’s a personal gripe more than a critical one. I think. Recommendation: The first story does better reminding the reader of other events better than some other attempts I’ve seen, and allows the crossover prologue to start off without the baggage. Worth checking out if you follow the event or for completion purposes. Posted by ShadowWing Tronix on January 8, 2019 in Marvel Spotlight, Yesterday's Comics and tagged Abner Little, Coucil Of Antiquarians, Count Andreas Zorba, crossover, Dr. J. Vernon Mann, Inferno, Iron Man, Marvel Comics, Marvel Universe, Princess Zanda, The Eighth Day, Warbird.